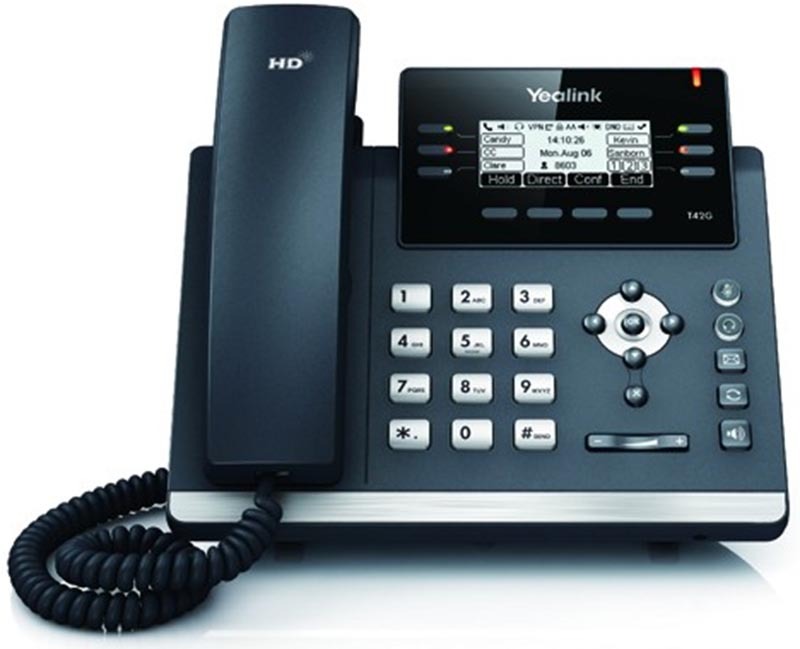 The SIP-T42G is Yealink latest feature-rich SIP business phone. Packed with productivity enhancing features including SCA, BLF List, call forward, call transfer and 3-way conference, Yealink’s Optima HD technology delivers crystal clear audio. The SIP-T42G, part of Yealink’s new generation T4 series, is a feature-rich SIP phone designed for today’s business user. This 12-Line IP phone has an elegane and ergonomic design that ensure easy, accurate use of all operations on the handset. Yealink’s Optima Audio technology deliver superb sound quality, and the 2.7″ inch 192×64 graphical LCD screen provides a rich visual experience. dual LAN ports support seamless integration to Gigabit Ethernet based network infrastructure. The SIP-T42G’s 6 navigation keys, 5 dedicated feature keys (message, headset, mute, redial and hands-free speakerphone ) and 4 context-sensitive softkeys makes it easy to access the wide range of productivity-enhancing features. support for the latest standards-based encryption protocols ensure highly secure operation of the handset, including remote provisioning and software upgrades. A prominently displayed ‘message waiting’ LED and six line keys, each with an associated LED indicator provide ‘at a glance’ information to phone users.